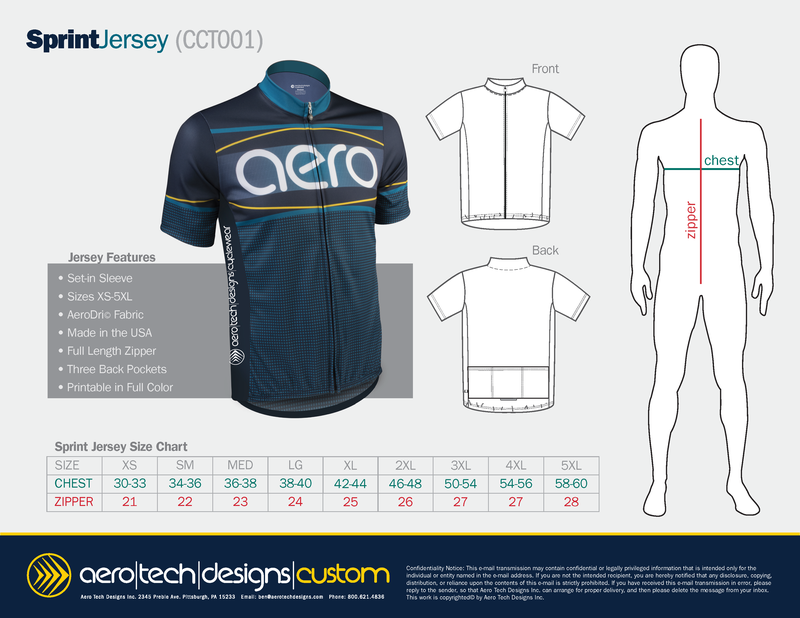 Aero Tech Designs introduces the Sprint Jersey. Similar to our solid color jersey, the Sprint Jersey has a classic casual fit that is assembled from 100% polyester AeroDry™ fabric with set-in sleeves and tagless labeling. A full zipper with an Aero Tech Designs pull tab is standard and the Sprint Jersey comes equipped with three easy access pockets for water bottles, food, and extra clothing. This jersey is the perfect cost effective customization option for charity rides or special occasions. The Sprint Jersey is available in sizes X-Small to 5XL in regular and tall sizes, sure to fit any size cyclist in your group. Hand crafted in the USA.Three generously sized rear pockets are designed for easy access, but tight enough to keep water bottles and nutrition bars inside safely. Pockets are reinforced for long life. The hem is slightly elastic to hold the garment snug to hips to keep it in place and prevent flapping in the wind. The neckline has a sublimated, tagless label that eliminates skin abrasions and irritation from inside the garment. Frontal full length zipper with an Aero Tech Designs pull tab is standard on all Peloton Jerseys. It can be easily customized with sublimation or screen printing and provides vivid color and texture. Use our Full Custom Design Services - Endless possibilities of color, text, logos, and design elements on your back. If you have advanced graphic skills, you can download the Aero Tech Designs Template - Sprint Jersey. so you can start designing using Adobe Illustrator. Choose from a selection of pre-made templates in our Semi Custom Design tool! Try your hand at designing your own sprint cycling jersey on our Design tool! Check it out Below and Experiment! Start your design process HERE. Pick from Semi Custom or Color Custom, Tops or Bottoms, then Choose a Design, Change the Colors, Add Your Logos, then Send in your Sizing. A customer service representative will send you information on how to get your jersey in 2-4 weeks! Learn More about Semi Custom Here!